We hold expertise to produce the comprehensive collection of Rotary Optional Encoders, which in line with the international quality standards. These are engineered accurately to give optimum performance and accurate functioning. The use of optimum quality raw materials ensue that these are compact in design and smooth finishing and consume lees energy. 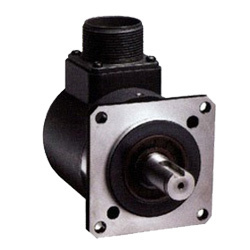 We offer our honored clients E Series of Rotary Optional Encoder. Our products are developed with the help of remarkable technology and are effectively used to detect angular velocity. Our product is highly demanded in the market and it adheres to the optical communication principle. Moreover, it is a sort of angle-measuring sensor which is used to convert angular velocity that is an input into the shaft to the corresponding pulse numbers. They are very small in size and are available at cost effective rates. Moreover, they are highly efficient, reliable and are capable of detecting speed, rotation direction and angular displacement. 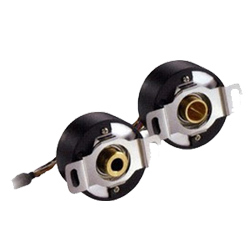 We pride ourselves as high quality service providers and are completely instrumental in offering a Series of Rotary optical Encoders (Item Code: ROE-A). Our products are developed from sophisticated technology and are completely in line with the international quality standards. 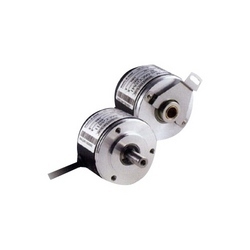 Due to the adequate and effective mechanical position of the encoder, they have the ability to remember the position. Therefore, even if the reference point is not searched, the absolute position remains very easy to be found and memorized. Plus, we develop these products as demanded and desired by clients’ and they are offered at the most customer friendly rates. With our effective specialization and expertise in this domain, we are providing M Series of Rotary Optical Encoders (Item Code: ROE-M). These encoders are developed from the best available technology and act as a commutation encoder which is perfectly designed for servo motors. Available in numerous designs and specifications, they are not only capable of detecting the U, V, W signals of servo motor for commutation but also output the signals of A,B, Z phase. There are 4, 6, 8, and 10 pairs of magnetic poles for user’s choice. Plus, our products are available in effective costs and are developed from grade raw materials. Our customer base has rapidly expanded and we are presenting Rotary C Series of Optical Encoders (Item Code: ROE-C), which is highly specialized CNC Machine Tool CS7 Series. Our products are very necessary for avoiding high resonance and much oil & gas problems occurred in machine tool applications. 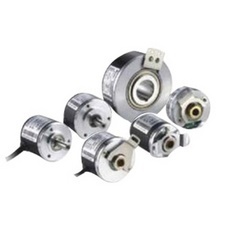 These Rotary Optical Encoders have the new mechanical design and are developed according to the most updated market standards. Moreover, they include high standard electric specifications and are available in various designs. They are highly desired by customers’ and are effectively suitable for all kinds of CNC machine tools. The corresponding rotation speed of CS7 series can achieve 8000rpm, and the response frequency of output signal can also reach 300 kHz.